The first question should be: What is a Brand? A brand is more than a logo; a brand represents your company in a way that will be recognizable and relatable to your target audience. 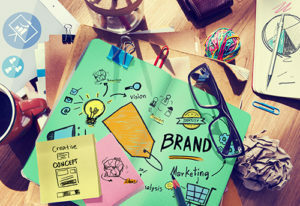 A brand is what makes a company memorable — customers and clients associate the service and quality of a company with the image that represents your company. The next question will be: What do I use the Brand for? Your brand is how your company is portrayed to your audience. All of your marketing should be cohesive in your message. Whether you’re focusing on being dependable or on having the fastest response times in the state, you must use a marketing strategy that will portray this message across the board. This allows your audience to understand what your company stands for while also easily recognizing your brand in different marketing arenas. The last question is: How does my Marketing Strategy promote my Brand? This becomes a mixture of creating innovative, memorable ads and marketing campaigns and providing top notch service that gives your customers or clients a reason to want to remember your brand. Once they have a reason to remember, providing them with the right graphics and well-placed advertising makes it simple to remember and easier to recommend. Give us a call if you’re interested in marketing your brand to become more recognizable to your target audience and how you can grow your client base with some simple graphic and marketing changes.